In the case of leader-follower networks, one or more agents (the leaders) can be used to inject control inputs into the system. In these networks, one can analyze the “effectiveness” of the inputs by borrowing a notion from robotics known as manipulability. 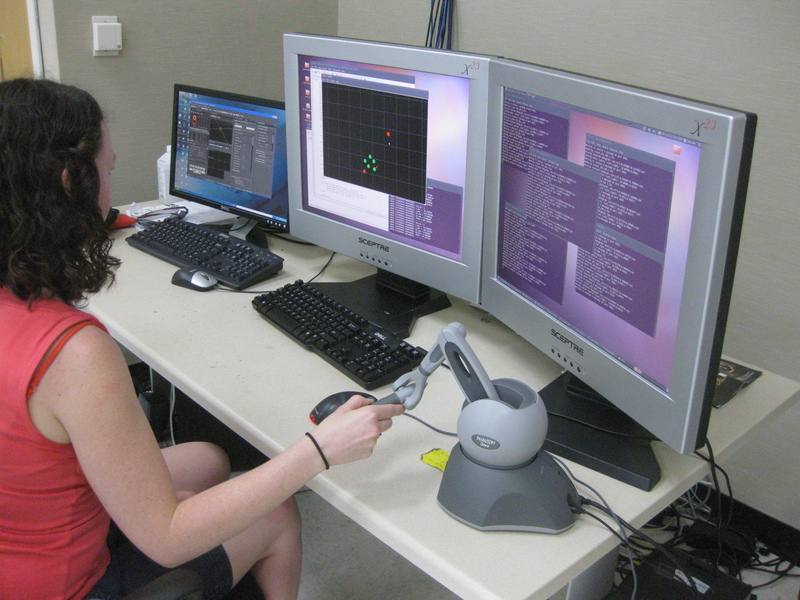 In robotics, manipulability indices were developed as a means to analyze the efficiency of robot-arm manipulators. We can model the manipulability of a leader-follower network after the manipulability indices of a robotic manipulator to analyze the effectiveness of inputs to the system. In this sense, manipulability is taken to be the ratio between the norm of the followers’ velocities to the norm of the leaders’ velocities. In this project, one goal is to allow a human operator to “feel” the manipulability of a leader-follower network of mobile robots through the use of a haptic device. The operator uses the haptic device to control the velocity of the leader of the network of mobile robots. Meanwhile, this haptic device (Phantom Omni was used), generates forces that either encourage or discourage the user to move the leader of the network in certain directions, depending on the manipulability of the system. The haptic device should encourage the user to move the leader (and thus the network) in the direction of maximum manipulability, while discouraging the user from moving the network in directions that result in low manipulability. A main part of the project was to focus on creating different mappings between manipulability and magnitude of the force generated by the haptic controller. These mappings included one that was linear and four exponential, with different decay parameters. User studies were done in which the users were to drive the network of mobile robots to specific task locations and each user had to repeat the experiment five times, each time using a different manipulability-force mapping. The goal of the studies is to determine whether one of these mappings is preferred by users and/or if one of them does a better job at maximizing the manipulability of the network.